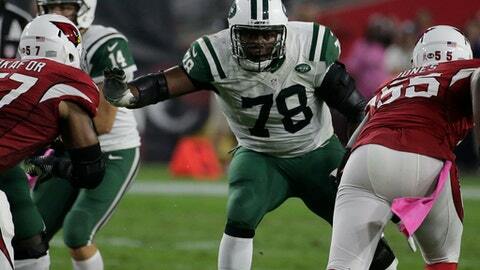 NEW YORK (AP) Ryan Clady’s tenure with the New York Jets lasted just one injury-shortened season. The left tackle was released Wednesday when the Jets declined to pick up a $1 million roster bonus, according to a person with direct knowledge of the team’s plans. Clady was due $10 million next season, making his return to New York under that contract unlikely. The person spoke to The Associated Press on condition of anonymity because the Jets had not yet announced the move, which ESPN first reported. Clady, acquired last April from Denver to replace the retired D’Brickashaw Ferguson, was limited to only nine games because of a torn rotator cuff. He was injured in Week 3 at Kansas City and played through it for a few weeks. When his shoulder failed to respond to treatment, the Jets decided to shut Clady down for the rest of the season and placed him on injured reserve. The move Wednesday created $10 million in salary cap space for New York, which could make other cuts involving high-profile players during the next few weeks. The 30-year-old Clady was coming off a torn knee ligament that sidelined him all of the 2015 season, but he was ready to start in Week 1 for the Jets. Clady was replaced by Ben Ijalana, who is scheduled to be an unrestricted free agent. Ijalana started the season rotating with Brent Qvale at right tackle before shifting over to left tackle. The Jets could re-sign Ijalana, but also opt to re-sign Clady in free agency, but at a much lower salary. Otherwise, New York will be in the market for a left tackle through free agency or in the draft. When healthy, Clady has been one of the game’s best at his position, making four Pro Bowls since being Denver’s first-round pick out of Boise State in 2008. Staying on the field, however, has been a problem the last few years for Clady. He has missed 37 of his teams’ last 64 games because of injuries.